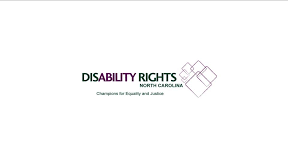 DisAbility Rights of North Carolina is seeking to block North Carolina from making major cuts to its community-based services. The lawsuit is on behalf of two individuals whom would be forced to live in institutional settings after living in regular communities for years. One of the individuals has been diagnosed with anxiety disorder, mental retardation and Down syndrome. The other has been diagnosed with psychotic disorder NOS, autistic disorder, severe mental retardation and cerebral palsy. Both require supervision 24 hours a day. The case was filed in December 2009 in the U.S. District Court for the Eastern District of North Carolina, which granted a preliminary injunction against the state a month later. In its amicus brief filed in December 2009, the Justice Department argued that the individuals would have suffered “irreparable harm” from even a short placement inside an institutional setting. States are required to provide community-based services by the Supreme Court’s 1999 Olmstead ruling, which upheld the “integration mandate” of the Americans with Disabilities Act prohibiting the unnecessary segregation of people with disabilities into institutions. However, the decision allows for exceptions to implementation in cases when the costs are unreasonable and would represent a “fundamental alteration” in how the state provides services. The Justice Department charges that the state’s argument that it can’t afford community based services is unjustified, noting that it would spend more than $30,000 per person to transfer individuals into an institutional setting. DisAbility Rights of North Carolina is part of the federally funded protection and advocacy system and a member of the National Disability Rights Network.